They're heart attack inducing wedges of stodge, aren't they? Not at all, say the Pork Pie Appreciation Society you just have to know where to find the good ones. 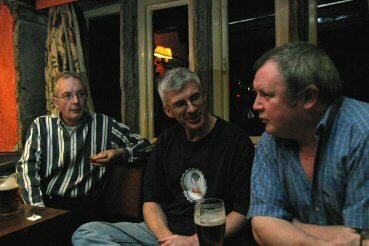 Peter cossins joins them down the pub in Yorkshire for a night of tasting. You either love them or hate them. We’re talking pork pies. Irresistible to some with a lump of ched­dar and a dollop of pickle, derided by many more as fat-soaked containers of the worst bits of a pig, encased in slimy jelly and artery-clogging pastry but, according to the men of the Pork Pie Appreciation Society both camps are missing the point-which is that most people are unqualified to pass judgment on the British pork pie be­cause they have never had a proper one. And what are the society’s credentials? Simply this: that its members have eaten their way to expertise through running their own tasting regime for more than two decades, so that today they constitute a sort of pork-pie parliament. 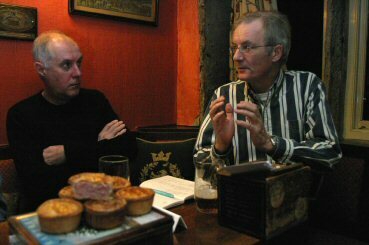 Every Saturday night, the society meets at its operational base in Rip­ponden, West Yorkshire-specifically in the Old Bridge Inn, one of the oldest pubs in the county to discuss world events and the more pressing matter of what makes a good pie. For a start, all supermarket-supplied pies are dismissed as the Austin Allegros of the pie world, fail­ing to meet the society’s most basic requirement of being freshly baked. What the tasters are looking for is a pie at the Rolls-Boyce level-one that looks appealing, is clad with freshly made pastry, is complemented by delicately flavoured jelly and contains a meaty heart that tastes hammy. And one that has not been chilled to the bone, but is sold and served at room temperature. All this began when a group of friends joined a gym opposite the Old Bridge Inn in 1.982. Exercise over, they would head across the road to the pub for a restorative pint. “Because the pub didn’t have a licence to serve food on Saturday afternoons, we couldn’t buy anything much to eat there,” explains founder member, Peter Charnley, a pharmaceuticals salesman. “One of the group used to bring a pork pie and share it with us, then one week he couldn’t come and we decided that we’d take it in turns to bring pies.” As with most things involving men, he says, pie-buying soon became competitive. Each week a designated member of the group, “the fetcher”, went off before the gym session to buy the pies, which were tasted and rated that evening. They sought out pies from every corner of Yorkshire, then from across the border in Lan­cashire, and eventually from any butcher or baker who made glorious claims for his pies. More than 20 years on, they are still at it. The gym across the road has long since closed, most society members are now in their 40s and 50s, hut they still meet every Saturday night looking for perfection in pies. Several of them have been sampling so widely and for so long, they can identify a pie’s maker just by the look of the pastry. In 1992, the society began putting its expertise to wider use by inviting butchers and bakers across the coun­try to enter their best pies in a con­test. Every year the numbers grew. The result is the National Pork Pie Competition, which is about to rack up its 12th anniversary with about 60 pies contending for the low-key prize (£100) this Saturday at the Old Bridge. 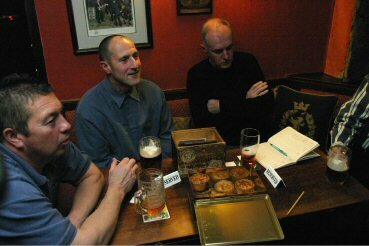 The judges include TV chef Brian Turner, the Yorkshire Post’s food critic, Robert Cockroft, and local pastry superhero Pork Pie Man, aka builder and society member Stuart Booth, in a pie costume left behind by a former competitor. What makes a good pie from the butcher’s point of view? “We use shoulder pork in our pies, which has a good flavour. We can’t disclose too much about the spices we add, although there is salt and pepper there and a little bit of mace,” he says. 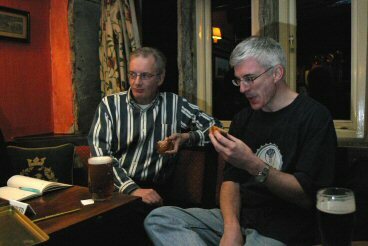 With this week’s championship in the offing, I joined the society’s regulars at their tasting at the Old Bridge. What, I wanted to know makes their ideal pork pie? “Well, for a start it shouldn’t come out of a fridge,” says the society’s chairman, Kevin Booth, a lorry driver. At a stroke, that rele­gates most of the pies produced com­mercially in Britain. Because only a pie that is freshly made and quickly sold in that happy state has no need of the fridge storage that produces the chilly, leaden brick that is all most of us know of a British pork pie. Other suggestions on what make a good and bad pie come from around the table. “Presentation is very important because it gets you in the right frame of mind,” says Stuart Booth, this evening’s fetcher. Then to the serious discussion of Booth’s fetch. “They were heavy, a real man’s pie,” says Bob Letven, another founder member. “There was lots of jelly, it was very well filled, one of the nicest I’ve had in a long time.” He gives the pie eight out of 10. The fetcher’s privilege of passing the final verdict went to Booth. “It was a full pie with lots of jelly, full of meat, a championship-winning pie, it was fantastic.” He reveals his fetch has come from defending national pork pie champion Hinchliffe’s of Netherton, near Huddersfield. The pies rate an average of 7.9 and easily avoid the fate of some less well ­favoured fetches, which have been cast under the old bridge and into the swirling waters of the River Ryburn.